Keeping the Pounds Off! 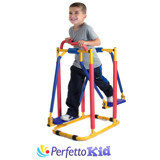 : Perfetto Kid Fitness Equipment - Should your Little Tikes be Feeling the Burns? 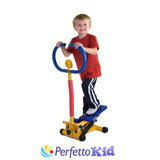 Perfetto Kid Fitness Equipment - Should your Little Tikes be Feeling the Burns? According to the media, we are currently raising the first generation that will not outlive their parents due to their poor fitness and nutrition. So of course, a corporation has jumped on that bandwagon - because there is money to be made by playing on the fear of parents! Lots of money! 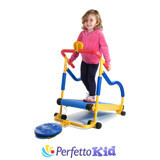 Enter the newest in children's activity toys: The Perfetto Kid line of fitness training equipment. I am NOT making this up. These items can ALL be purchased at the BJs Warehouse Stores. I got the advertisement on line. 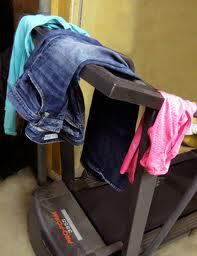 Now kids can work out like Mama, sweat like Dada and do it just as incorrectly as their parents! Are cartoon-character trainers on DVDs playing on he TV scene while the kids are using the new toys, instructing these kids during their workouts on what muscles to tighten and proper form for each machine? Will this new 'toy' increase the need for pediatric orthopedic doctors? What about all the gizmos and gadgets still to come? Will we soon have child sized yoga mats and kettle balls? Mini portions of replenishment liquids? Perhaps bubblegum flavored Gatorade? Workout diapers? Or, maybe I am off the mark. Is this a great way to get kids into the gym early in life so they will think it is a daily ritual worth keeping by the time their are old enough for their own gym memberships? Or will they rebel from working out just when they reach the age when they will need it most, the way so many kids seem to shy away from religious practices when they first enter their adult world. When I was very young my parents bought me a kitchen play set, complete with store, refrigerator, pots and pans, dishes and storage cabinets. It just encouraged me to develop my imagination and play. My childhood kitchen cabinets where always a mess. My mom used to complain that I hid all my junk in there - including toys that had nothing do due with the kitchen. As I got older I no longer took the play kitchen seriously. While the play kitchen did encourage to me want to cook and eat, it did not encourage me to clean my kitchen, develop good nutrition or keep my hands off the hot stove. By the time I had children their kitchen play sets had evolved to include play-microwaves, plastic foods and play-wall phones to call for play-take out. What will today's children get from their child-sized play YMCA exercise center? When all is said and done, is this something that will help the next generation in keeping the pounds off? Or, will this stuff become, like many of the adult versions, fancy clothes hangers, holding the latest castoffs in Oshkosh fashions? I don't think I'm a fan of this.. There are so many other activities kids can do to be active... don't know, just doesn't feel "right". I want kids to be healthy - playing kid games, not mimicking adults at the gym. I kinda feel like kids should play to stay healthy and active. I don't see anything wrong with encouraging sports, or showing them that fitness can be fun but not like this. I'd rather show my kids by DOING the work. And teach them that hiking and biking are fun (and fitness)!